1. Paving 2014 … All the 2014 paving that was scheduled and, that can be done has been completed. This amount to about 30% of the paving that was scheduled for 2014. Of the roads that were not completed only Vernon Ridge has the possibility of being finished in 2014 … we are awaiting final water line work by DC on Vernon Ridge. The big projects and of course most visual that were scheduled and that will not be completed in 2014 are Chamblee Dunwoody Rd from Roberts Dr to Cambridge and Mt Vernon Rd from just east of Ashford Dunwoody Rd to Vernon Oaks. These two projects will be pushed back to 2015. The reason for this is the water lines, many of which run under these roads, must be replaced by DC prior to paving. I don’t like this delay any more than anyone else but we have taken steps to move this process forward. We have signed an Inter Governmental Agreement (IGA) with DC to include the roadwork, paving and water line replacement in one bid. The bid will go out as one bid — which we control — but DC will pay for and supervise the water line replacement and the city will supervise and pay for the roadwork and paving. Our thrust is to have the water line replacement completed by the spring of 2015 in order for us to initiate and complete the roadwork and paving. The remainder of this year’s paving funds, approx. $1.4 million will be rolled over and will be in addition to the approx. $2.5 million that will be budgeted for 2015 paving. 2. Cost of Infrastructure Improvements … As the economy has improve we have noticed the construction costs has increased due to contractor being busier than in the last 2 - 5 years as we’ll as the cost of materials has increased. 3. Sanitation … The “once a week pilot” ended July 31 in DC. Until a final decision is made we will stay on whatever pick up frequency that you were on during the pilot program. My “gut feeling” is that DC will go with the once a week pick up as the norm. It appears that the “three/four times a week pick up” may remain as an option but at a higher cost than the current rate of $265/year … (this rate has remained the same for several years). To date we do not know what that additional cost will be. I am doing my own survey so I need your response. Do you favor “once a week pick up” … Yes or No. Secondly, if you are in the “once a week pilot program” give your rating of the pilot program from 1 to 10 with 10 being the best. Also include any comments. To answer questions about the size on the containers … DC is considering the current 65 gal can and a 35 gal can (35 gal is the size I was using prior to receiving the 65 gal can from DC). DC is also considering a can for recycling just like the green cans only colored blue. There has been no hard final decisions by DC to date. 4. City Updates … We are putting out updates via our city email list … we have over 11,100 folks signed up to receive these email updates. I recommend you sign up to stay informed. Go to the following website to sign up … https://public.govdelivery.com/accounts/DUNWOODYGA/subscriber/new or check our website at http://www.dunwoodyga.gov. The City DOES NOT GIVE OUT YOUR EMAIL ADDRESS TO ANYONE. An unlike my emails, you won’t have to correct the spelling. 5. Dunwoody Village Parkway (DVP) … Like everyone else, I am not happy with the progress of the construction. Yes, we had a lot of rain thru the early months of the year and as we were replacing all storm water pipes we found issues. One such issue was by Mellow Mushroom where the storm sewer pipes were never properly connected … thus as many of you saw we had to dig down 23’, with some of the digging required to be done by hand to correct the problem. On a positive side, since we got the first two lanes paved the progress rate has increased. What you see completed is a 22’ wide strip with 6-8” on aggregate, 3” of base asphalt and about 2” more of adhesive asphalt. There will be an additional 10’ width of paving added. When it is done there will be an additional 1.5” top/finish-coat of asphalt added over the entire paved surface. Outside the curbing on each side will a 6’ landscaping buffer (the trees will be planted here) and outside the landscape buffer will be a 6’ sidewalk. My optimistic estimated completion date is 31 OCT 2014. SEP 3rd … Walk to School Day at all of our Dunwoody Schools … Even if you don’t have children in school join the walk and meet our great teachers and children. SEP 4th … 9 AM … DC Ribbon Cutting Ceremony … N. Shallowford and Till Mill booster pump station. SEP 18 … 2 PM … DWC Conservation Dept. dedicating an “Adopt A Bench” to the DWC passed Presidents at the DNC. SEP 30 … The last date to pay the first installment of you DC Property Tax. OCT 1 … 9:30 AM - 3 PM … DWC Annual Home Tour. 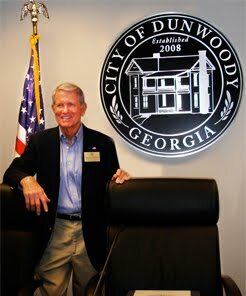 NOV 1 … Dunwoody Volunteer Coordination Committee’s annual .. “Clean, Fix and Shine Up Dunwoody Day .. More details later. 7. That is all from here this afternoon. I trust all of you will be enjoying yourself with family and friends this beautiful Labor Day weekend. Remember we are all neighbors so lets be kind to each other. Please pass this update on to your friends, neighbors, members of your HOA and anyone you think maybe interested. If you would like to be added to my update email list just let me know and I will make that happen. I appreciate your thoughts and comments so keep them coming. PAID FOR BY CITIZENS FOR DENIS SHORTAL. Blog Design Customized by Kapp Koncepts.